Born in Bechari (Bsharri), Lebanon in 1883, Gibran was modeling, drawing, and writing at an early age. After coming to the United States, Gibran was introduced to F. Holland Day, a photographer, who tutored him in art and literature. In 1904, Gibran had his first art exhibition in Boston, and in 1912, he settled in New York, where he devoted himself to writing and painting. The basic subject in Gibran’s art was naked human bodies, tenderly intertwined. 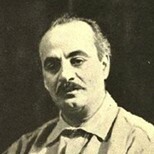 Gibran’s early works were written in Arabic, but he wrote mostly in English from 1918 and managed to revolutionize the language of poetry in the 1920s and 30s. Gibran typically used prophetic tone to condemn the evils that tormented his homeland or threatened the humankind. After his death in 1931, the Gibran Museum was established, and in his will, he left all the royalties of his books to his native village. In 1904, Gibran started to contribute articles to the Arabic-speaking émigré newspaper called Al-Mouhajer (The Emigrant), marking his first published written work. In 1920, he founded a society for Arab writers called “Aribitah” (the pen bond) and supported the struggle to revolutionize the classically conservative Arabic literature. • Advance and never halt, for advancing is perfection. Advance and do not fear the thorns in the path, for they draw only corrupt blood. • An eye for an eye, and the whole world would be blind. • I have learnt silence from the talkative, toleration from the intolerant, and kindness from the unkind; yet strange, I am ungrateful to these teachers. • If you reveal your secrets to the wind, you should not blame the wind for revealing them to the trees. • You give but little when you give of your possessions. It is when you give of yourself that you truly give. • To understand the heart and mind of a person, look not at what he has already achieved but at what he aspires to do. • I prefer to be a dreamer among the humblest, with visions to be realized, than lord among those without dreams and desires. • And forget not that the Earth delights to feel your bare feet, and the winds long to play with your hair. Gibran’s book, The Prophet, first published in 1932, has sold over 11 million copies, and this is the place to start. This beloved classic has been translated into over 20 languages. The book contains his philosophy on major concepts in human life, such as love, joy, self-knowledge, freedom, and friendship. The emphasis of The Prophet is on the individual’s quest for enlightenment and inner peace. The book opens up in the twelfth year, on the seventh day of Ielool, in the city of Orphalese. It begins with the story of Almustafa, a mysterious prophet who is leaving the city after spending 12 years there. Before he leaves, the people of the city ask him to share his wisdom, and the book is the wisdom that he shares. You talk when you cease to be at peace with your thoughts. And when you can no longer dwell in the solitude of your heart, you live in your lips, and sound is a diversion and a pastime. You work that you may keep pace with the Earth and the soul of the earth. For to be idle is to become a stranger unto the seasons and to step out of life’s procession, that marches in majesty and proud submission towards the infinite. The Prophet has been described as a classical treasury of mystical insight; the words of this book are inspiring, powerful, and magical. It is a gift for all of us.